3) High Maximum Potential Punishment. 1a) Initially, moderate future profitability. 1b) Over time, weak future profitability. 3a) Initially, high maximum potential punishment. 2b) Over time, low conspicuity. 3b) Over time, low maximum potential punishment. By using an incentives/disincentives model to map the divergent behaviors of multinational corporations (MNCs) confronted by a sanctioned economy, I explain why some economic sanctions work better than others at achieving their desired political outcomes. When presented with the opportunity to "run the blockade," MNCs are incentivized to sanction bust by the allure of higher profit through rent extraction. At the same time, MNCs are disincentivized to sanction bust by the penalties for breaking the sanction, but only if MNCs believe sanction busting operations is inconspicuous enough to avoid detection. If the incentives to sanction bust outweigh the disincentives not to, then MNCs will trade with sanctioned states, as was the case with Rhodesia. Since MNCs were crucial to both the Rhodesian and the South African economies – as it provided oil to the former and operated a significant minority of the firms in the latter – the decisions of MNCs to remain engaged in Rhodesia and to disengage from South Africa had a significant impact on the economic and political life of the two apartheid regimes. Hence, while many economic and political indicators identified by literature predicted that Rhodesia would have a shorter life expectancy under economic sanctions, Rhodesia defied all expectations and survived twice as long as South Africa. Given the sudden popularity of economic sanctions as a policy instrument, many scholars have studied it. But despite the proliferation of literatures on economic sanctions, few studies have compared the impact of economic sanctions against Rhodesia and South Africa on the political resolution of Apartheid. This gap in literature is surprising, because a comparison of the two Apartheid regimes under sanction allows for a great "most-similar cases" research design, in which most exogenous variables that may affect the result are kept constant. Rhodesia and South Africa were both post–colonial Apartheid states with resource extraction economies. Both states received a comprehensive U.N. sanction regime that banned the trade of nearly all goods with nearly all nations. But Rhodesian Apartheid held out for 15 years under sanction, while South African Apartheid barely survived seven. Why is there such a big difference in the effectiveness of sanctions? Conventional literature points to state-centric factors, like differences in political systems or macroeconomic structures. Such factors fail to answer the question. Political and macroeconomic divergences between the Apartheids states were either nonexistent, or predicted that Rhodesia – not South Africa – would be weakened more by sanctions. Instead, the key to understanding the mystery must be sought in non–state actors: the MNC. Rather than differences in state-centric factors, the divergent decisions of MNCs to sanction bust in Rhodesia – but not in South Africa – decided the fates of the two Apartheid states. Rational and profit-maximizing actors, the MNCs made this crucial decision by weighing the incentives and disincentives of sanction busting in a process that considers profitability, punishment, and conspicuousness. On one hand, the prospects of capturing large rents from sanctioned economies and hence earning high profits gave MNCs an incentive to run the blockade. On the other hand, the penalties threatened for disobeying the sanction regime dissuades MNCs from sanction busting, but only if the MNCs were caught. Like people, MNCs will respect laws only if they are enforced, and laws are enforceable only if the offenses are discovered. MNCs will sanction bust if and only if the incentives to do so outweigh disincentives not to. The Rhodesia/South Africa story has broader implications: policymakers should consider not just state-centric factors, but also the micro economies that regulate the incentives and disincentives for sanction busting. Individual market actors, not the state, are the vehicle of global trade; sanction regimes that do not secure the cooperation of these actors are bound to fail. This study will develop the argument in six sections. The following section will summarize the history of Rhodesia and South Africa before and during sanctions for unfamiliar readers. The third section will condense the literature on what determines sanction success, and why they cannot explain the Rhodesian and South African cases. The fourth section will describe the incentive/ disincentive model. The fifth section will apply the model to the Rhodesian and South African cases to explain the divergent sanctions outcomes. The last section will present the conclusions of this study and the implications of the incentive/ disincentive model for the larger sanctions debate. Until the mid–20th century, segregated, colonialist societies faced little international opposition: Singapore, Australia, the United States, and many other countries all denied suffrage and other key civil rights to people of non–Caucasian descent without inviting international condemnation. However, with the rise of the civil rights movement and the decolonization movements around the world in the late 50s and early 60s, international norms turned against states that continued to racially segregate their people. Because of this change in international opinion, Rhodesia and South Africa were both subjected to a U.N. authorized sanction regime from 1965-80 and 1986-93, respectively. In both cases, the U.N. sanctions were intended to force the two states to abandon their Apartheid policies and grant suffrage to their disenfranchised African majorities. The sanctions aimed to change the policy, not the regimes; that said, many who were targeted by the sanctions felt that Apartheid was such a crucial aspect of their regime, that granting suffrage to Africans would undermine it. The outcome of the U.N. sanctions could not have been any more different. Rhodesian Apartheid, against all odds, survived for 15 years under economic sanctions. Rhodesia accepted power‒sharing with African party members only when the African guerilla fighters made their military situation untenable. If Rhodesian military situations were more favorable, they may have survived the sanction regime for a lot longer, perhaps even indefinitely. In contrast, South African Apartheid barely lasted eight years, after which it extended suffrage to Africans and released Nelson Mandela from prison. Because was no military threat to the South African government, the South African decision to end racist policies was primarily an outcome of economic pressure. One of the most common determinants of the sanction's effectiveness is the nature of the sanction–targeted state.6 This line of thinking makes sense; the same sanction package may cripple a small nation with little domestic manufacturing capacity to meet internal demand, but barely affect a large nation with the domestic industries to achieve autarky. Likewise, a sanction may be lethal to an export-oriented economy, but a mere annoyance to an economy sustained by domestic consumption. Another equally intuitive exercise will examine the breadth and depth of the sanction package.7 The breadth of a sanction package is the proportion of the global market that would participate in the sanction. Obviously, if the United States restricts access to its market, then the sanction would be much more effective than if the United States did not. The depth of a sanction package is the number of commodities sanctioned. In 1983, Australia refused to sell uranium to France; while the sanction did some harm to the French nuclear program, it had little impact on the health of the macroeconomy.8 If Australia had restricted French access to its entire market, the French economy would have been more acutely hurt. 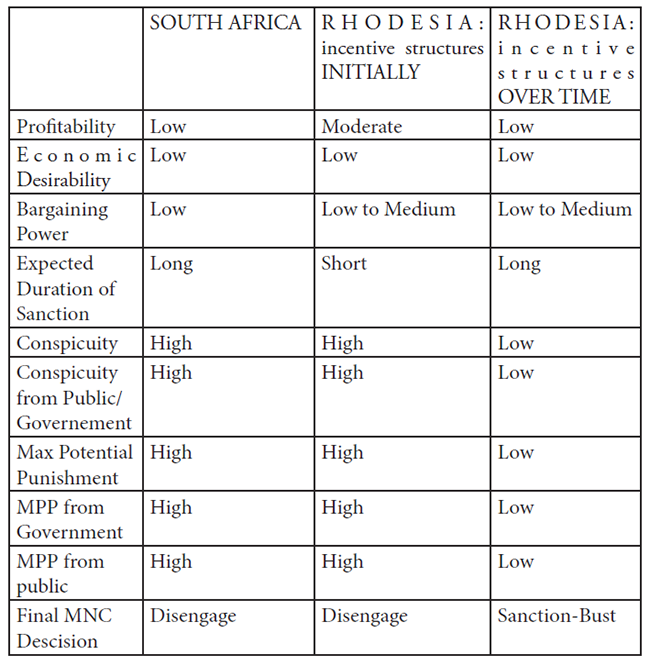 While these two intuitive variables of comparing the national context or the sanction package to determine divergent sanction outcomes offer easy ways out, they are unhelpful in explaining the outcomes in Rhodesia and South Africa: both the national context and the sanction package remained constant between the two countries, which means neither could explain the differences in outcomes. Almost all the key national characteristics of sanctioned Rhodesia and South Africa were astonishingly similar. Both states had a large African majority dominated by a white minority, an Apartheid political system, an isolated diplomatic status, tenuous trade relations, a Southern African geography, an Afrikaan-British heritage, a British colonial history, and an agricultural and mining-based export economy. If any one of these factors were different, it could at least partially explain the sanctions outcome. But with these key national characteristics held largely constant, none of them can explain the drastically different sanctions outcomes. Both Rhodesia and South Africa were placed under comprehensive Hurbauer, Economic Sanctions Reconsidered, 91. economic sanctions with nearly universal participation from all major and most medium powers. For both countries, the sanctions seriously inhibited trade, depreciated their currencies, limited access to international finance, cut off access to foreign aid, and froze foreign assets held by the target government and citizens.9, 10 And yet, the sanctions in Rhodesia and South Africa still produced significantly different political results. If similar sanction packages were imposed on similar countries, why did one collapse much more quickly than the other? When neither national context nor sanction package can explain sanction outcomes, the literature turns to micro variables for answers. Consider the following metaphor: if two people with similar phenotypes drank the same amount of milk, why might only one of them suffer indigestion? The doctors would answer that despite the similarities in the general circumstances, there was a miniscule, unclear, but nevertheless very crucial difference between the two individuals, perhaps a slight genetic disposition that makes one lactose intolerant. In a similar fashion, if proponents of sanctions attempted to resolve the Rhodesia-South Africa paradox, they would have answered that despite the similarities between the two sanctions, there must have been micro but very significant differences that contributed to the divergent outcomes. Unfortunately, these micro variables are inconclusive in respect to explaining the South Africa/ Rhodesia case. So what could have been a micro difference? One of the most widely known micro variables used to explain divergent sanction outcomes is the vulnerability of a state to economic sanctions relies on the target state's economic concentration: "the more a country's economy depends on one product, and the more its exports consist of one product… the more vulnerable is the country. "11 It is also reliant on commodity concentration, or the degree of consumer tastes that are concentrated on one commodity, and geographic concentration, the degree to which the target's trade partners are concentrated on one country. Here again, the implications of this micro foundation are counter-intuitive. According to a composite vulnerability index that considers these three types of concentration, sanctioned Rhodesia was the fourth most vulnerable state in the world, after Mauritius, Trinidad, and Panama (Galtung, year)12. There is no comparable measure of South Africa's economic vulnerability in 1985, but a comparison of the sum of net export and import, a rough indicator of a given economy's reliance on trade, reveals that Rhodesia was significantly more concentrated than South Africa. The import-export sum figure for South Africa at the time of the sanction was 22% of GDP,13 while the same figure for Rhodesia was a staggering 66% of GDP.14 These figures indicate that Rhodesia was an exceptionally concentrated, vulnerable state compared to South Africa, and predict the earlier demise of the former. Brooks claims the regime type of the target influences the effectiveness of a sanction -democracies are more vulnerable to comprehensive sanctions, which target the macro-economic health of the state, while autocracies are weak to targeted sanctions that attack the economic health of key stakeholders in the government.15 However, regime type is an inconclusive explanation in this case. With several possible explanations failing to resolve the Rhodesia‒South Africa paradox, many scholars argued whether the sanctions in Rhodesia and South Africa were effective at all in years during and immediately following the sanction.16 Citing the persistent economic rigor of the sanctioned Apartheid states, "sanction skeptics" have concluded that sanctions were inconsequential. Their most damning evidence came from Rhodesia. Despite the severe embargo, in 1973, eight years into the sanction, Rhodesia's exports grew, GDP rose by seven percent,17 and domestic manufacturing doubled compared to presanction levels.18 The nation also underwent significant political integration as Rhodesians "rallied to the flag. "19 In South Africa, despite significant movement to disinvest, MNCs maintained an indirect presence in the nation.20 Therefore, capital flight and disinvestment from sanctioned South Africa may not have been as economically devastating as the raw economic figures suggest. Despite these arguments, the academic consensus today is that sanctions on South Africa and Rhodesia did play a role in forcing political change.21 Many of the claims of Rhodesian strengths, made before 1975, did not consider the numerous hidden weaknesses directly caused by the economic sanctions, such as the dwindling state Foreign Exchange reserves, which broke into daylight only in the final days of Rhodesia.22 Galtung's articles, written in 1974, admit: "we do not know how (the sanction) will all end, and primary source material of a crucial nature is not yet available. "23 But while today's scholars agree sanctions did play a role in the demise of Rhodesia, they still have yet to consider the case of Rhodesia in a comparative context in relation to South Africa. The conventional literature fails to explain the Rhodesia-South Africa paradox because it suffers from a consistent over-emphasis of the role of state actors on sanction outcome. Baldwin and many other foundational scholars of the sanctions literature frame economic sanctions tools of "economic statecraft," without mentioning the impact of behaviors by non-state actors on sanctions effectiveness.24 Furthermore, sanction scholars tend to predict the effectiveness of sanctions by relying on macroeconomic or political microfoundations, such as export/import reliance and economic concentration, or regime type and political decision makers, which are all influenced by or a direct outcome of state behaviors. The reliance of sanctions literature on the behavior of state actors as an explanation follows a general partiality of political science literature to state actors. However, this bias has resulted in an unjustified presumption in recent sanctions literature that the effectiveness of economic sanctions can easily be maximized, and its collateral damage minimized through "smarter" sanctions policy with improved political and macroeconomic parameter setting by policy makers. Adherents of "smarter policy, smarter sanctions" risk reaching a reductive conclusion that policy makers who are aware of the political/macroeconomic factors affecting sanction effectiveness will produce more effective sanction policies.25 This claim is not empirically supported according to Drezner: despite the frequent implementation of "smart sanctions," sanctions have not become significantly more effective. "Smarter" sanctions, however, have not translated into better outcomes. This is because smarter sanctions ultimately suffer from a deficit in the entire economic sanctions literature in general. All previous scholarship on sanctions are incorrect in assuming that the success or failure of a sanctions policy is largely determined just by the decisions of policy makers and their macroeconomic and political parameter setting. They fail to account for the fact that sanction effectiveness is also determined by the decisions of the MNCs and their microeconomic parameter setting. If policymakers want to draft a truly "smart" sanction, they must not only consider the influence of state behavior on macroeconomic and political parameters, but also the impact of behaviors of non-state actors, namely the MNCs, on sanctions policy. I will construct a model to explain MNC behaviors. Of course, actual MNC decision making is much more involved, but the model has satisfactory explanatory power. In the next section, the model will be used to explain the outcomes of the sanctions placed on Rhodesia and South Africa. MNCs are international corporate entities with a single incentive: net profit maximization.26 Assuming MNCs will always choose options that will produce the largest net profit, if MNCs achieve positive net profit from sanctionbusting, they will sanction bust; if not, they will disengage from the sanctioned economy. "Profit Maximization," however, is an aggregate product derived from many incentives and disincentives. Hence, to determine whether a profit-maximizing MNC will sanction-bust or not, the incentives and disincentives that shape the corporate environment must be studied. The primary incentives and disincentives at work when a profit-maximizing MNC decides to engage with or disengage from a sanctioned economy are future profitability, conspicuity, and max potential punishment. Future Profitability is a positive incentive. It correlates with the perceived gross economic gain a MNC expects to obtain from engaging in sanction-busting trade. The larger the expected profit from sanctions-busting, the stronger the incentive will be for MNCs to engage with sanctioned economies. Conversely, the smaller the expected profit, the weaker the incentive to sanction-bust. Conspicuity is a negative disincentive. It correlates with the expected visibility of the MNC's sanctions-busting operation from the perspective of the sanctioning government and the public at large. High conspicuity significantly discourages MNCs from engaging in sanctionsbusting trade because it is more likely to invite punishment from the sanctioning government and the public. Max Potential Punishment (or Max Punishment) is a negative disincentive. It correlates with the expected severity of the gravest punitive action conceivable for engaging in sanction busting trade inflicted onto the MNC by the government and the public. Obviously, the more severe the max potential punishment is, the stronger the disincentive is for MNCs to engage in sanction-busting. In constructing the model, we assume that these three incentive/ disincentives are determined by several key input variables, listed below. The expected future profitability of a given sanction-busting trade is an output value that is derived from three input variables. One of these inputs is the general economic desirability of the sanctioned economy. This variable represents the key economic facts, (such as market size or production capacity) that MNCs consider when they decide whether to engage with a market, whether sanctioned or not. Unless the sanctioned economy has some economic value that makes it valuable to the MNCs, they would not trade with them even without sanctions. The other input variables are relevant only to sanctioned economies. One of these is bargaining power. MNCs must gauge how much additional bargaining power they have in negotiating with sanctioned economies. These economies are not in a position to take the global market price due to their limited access to the world market, and hence will have to take higher prices for imports and lower prices for exports. This is to the advantage of MNCs. The greater the bargaining power, the greater the future profitability. Significant bargaining power permits MNCs to act as a monopolistic price-setter that can undersell the sanctioned economy. The strength of an MNC's bargaining power is determined by the answer to three questions. (1) Are other MNCs participating in sanction-busting operations? If so, the other players will force the MNC to buy and sell at prices that are more competitive, reducing their bargaining power. (2) To what extent has the sanctioned economy achieved autarky? If the sanctioned economy has achieved a significant degree of autarky and can domestically produce the product supplied by the MNC, then the MNC will have to set prices competitive with domestic products. Whether autarky is possible or not would at least partly depend on the mobility and the alternative availability of the particular product provided by the MNC. If the product is highly mobile (eg. a consultant), then the product can be quickly pulled out of a sanctioned economy before there is enough time to establish autarky and produce sanctioned goods domestically. If the product is available from an alternative source, either from other MNCs or a domestic firm, then autarky is much easier. Lastly, there is (3), the expected duration of the sanction. This is a significant determinant of future profitability. If the MNC perceives the sanction to be a short-term affair, losses from hiccup in trade is far outweighed by the benefits of a sustained, long-term trade relationship. Information that is visible to governments is not necessarily visible to the public, and vice versa. For example, state intelligence may be aware of MNC sanction-busting, but intentionally not inform the public. Conversely, certain private actors with privileged access to insider information of MNC activities, like investigative journalists, may have information that the government does not. Therefore, a more accurate model than the one used in this study would take into account this information asymmetry. This would be done by disaggregating conspicuity into the conspicuity of the sanction-busting trade from the sanctioning government, and the conspicuity of the same trade from the public. Unfortunately, disaggregating conspicuity into these two incentives is beyond the scope of this study. Lacking access to key government archives, it is impossible to know whether information not known by the public at the time of the sanction was withheld by the government as classified knowledge, or was just as unknown to the sanctioner government as to the public. This methodological obstacle is circumvented by assuming that what information was known by the public was also known by the government, and vice versa. Therefore, in this model, the degree of awareness by either the public or the sanctioner government of the MNC sanction-busting operation is the single input used to derive the conspicuity disincentive. This assumption is not problematic for Rhodesia and South Africa. The most economically significant sanctioner governments of Rhodesia and South Africa, the United States and those of Western Europe, were liberal democracies, where information that was visible to the government was also visible to the public. Even if either the government or the public did come to acquire information that one of them was not aware of, the information barrier was low enough that information about the key sanctionbusting trades in the two countries (particularly oil trade in Rhodesia), and the FDI engagement of MNCs in South Africa) quickly diffused from one actor to another. The value we use for total Max Potential Punishment is derived from both the Max Potential Punishment sustainable from the sanctioner government, and the Max Potential Punishment sustainable from the public. If the sanction-busting activity is illegal, the punishment from the sanctioner government may come in the form of a fine, imprisonment, or other legal recourse.. If the sanction-busting activity is technically legal, it could come in the form of closing of loopholes, severance of government contract to MNCs, and other extra-judicial punitive measures. The most common and effective form of punitive action by the public is the boycott, where consumers refuse to buy the products of the offending MNC or otherwise engage in transaction with them. While it may seem wise to disaggregate public punishment and government punishment, this is not necessary. MNCs anticipate their actual punishment for engaging in sanction-busting trade to be much smaller than, and rarely equal to, the Max Punishment threatened. Such optimism is not exclusive to MNC. It is not uncommon for criminal entities to perceive the expected punishment as much lower than what is threatened. For example, students perceive the actual punishment of smoking marijuana to be much less serious than the Max Punishment because they are confident they won't be caught. This expectation as to what extent the Max Punishment will be realized is entirely dependent on conspicuity. Similarly, the students in the previous example will expect more serious consequences if, instead of smoking at home, they smoke in front of the police. Likewise, MNCs perceive that higher degrees of conspicuity makes it more likely for the government and the public to impose the Maximum Punishment, and less conspicuity makes such punishment less likely. The public is more likely to retaliate against conspicuous sanctionbusting operations because the principal method of retaliation used by the public against MNC, boycotting, requires widespread mobilization.28 Boycotting is a worthwhile weapon only if enough people participate. However, people would consider a boycott only if they are aware of the MNC's sanction-busting operations. The public is more likely to be aware of MNC operations that are visible; thus, a conspicuous sanction-busting trade is necessary to activate civil society in an effective retaliatory boycott. And: IF D < 0, THEN don't sanction-bust. The economic benefit of sanction busting is abstracted as P. Hence, a larger P correlates with a larger D, as higher the future profitability of a trade, the greater the incentive for MNCs to sanction bust. Future profitability only accounts for the gross future profitability of sanction-busting. However, sanction busting comes with its own expected cost that will depress net profits. This expected political and social cost of sanction busting is modeled by C*(MP). A larger MP correlates with a smaller D, as the more severe the maximum potential punishment is for sanctionbusting, the more MNCs are discouraged from engaging in such operations. However, the severity of the punishment imparts any meaningful weight on the MNC decision making only if sanction-busting trade is conspicuous enough for the government and the public to inflict all, or part of, the maximum possible punishment onto the MNC. In other words, no matter how severe the potential punishment is for sanction-busting, MNCs will only be discouraged if sanctionbusting is flagrant enough to invite punishment. 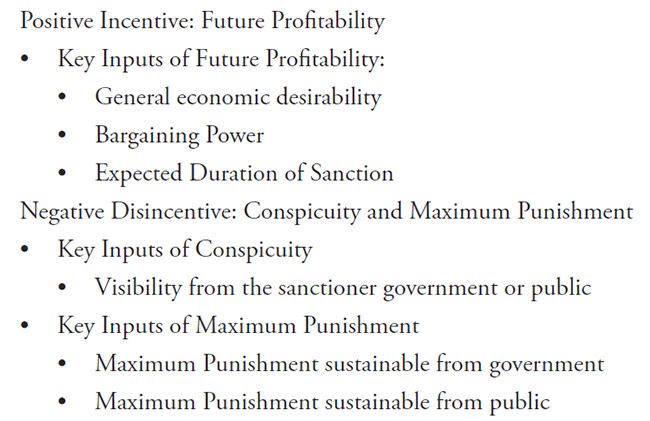 Thus, the extent to which the max potential punishment disincentivizes sanction-busting depends on conspicuity, a variable which ranges from 0 to 1 in this model. If Conspicuity is 0, the sanctionbusting transaction is invisible and hence the MNC decision making is unaffected by the empty threat of punishment. If Conspicuity is 1, sanction-busting is visible and the MNC expects the full weight of the threatened punishment. THEN: P − C*(MPpublic) − C*(MPgovernment) = P − C*(MPpublic + MPgovernment) = P − C*(MP) = D.
Now that the incentive/disincentive model for MNCs has been established, let us apply it to South Africa and Rhodesia. In each case study, I will first establish that the decisions of MNCs to engage or disengage, Rhodesia for the former and South Africa for the latter, weakened the state's economic health and its capacity to reject the sanctioner demand to end apartheid. This shows that MNC decision did affect the outcome of the sanction. Second, I will trace the decision-making process of key MNCs where I find the measure of the input variables, derive the incentive/disincentive from the inputs and add the incentive/ disincentive to derive the final decision of the MNCs and its impact on the sanctioned economy. Disinvestment harmed South African industries in two ways. First, it cut off local production facilities, previously owned by MNC subsidiaries, from the MNC's global supply and distribution network, leading to drastic reduction in corporate profits, wage, and unemployment. Second, because of disinvestment, the South African economy lost the practical and technical knowhow of the MNCs that was now integral to maintain South African competitiveness. The MNC decision to disinvest reduced South African access to global supply/distribution chains and MNC knowhow, which in turn paralyzed productivity growth from 1985 to 1993.34 This stagnation was caused by the sanction, as the economy recovered its high productivity growth after the sanction was lifted. One caveat to this narrative is that, since white-only suffrage excluded black and colored Africans from voting, the "median voter" of Apartheid South Africa was by no means synonymous with the "median citizen." In fact, the "median voter," who was most likely white and affluent, and the "median citizen," who was most likely black and poor, had different experiences in sanctioned South Africa. As in other historical examples of sanctioning, the population that the sanction was supposed to help suffered the brunt of the economic devastation; "the median citizen"– the many Africans under Apartheid – experienced even more drastic economic collapse under the sanction regime than did white voters.39 For instance, in companies formerly operated by MNCs before disinvestment, internal corporate regulations that barred discriminatory practices were repealed once each MNC administration was replaced by domestic management. The change in administration exposed the African employees of these companies to even greater discrimination and economic damage.40 Given the severe, short-term economic devastation experienced by Africans, which dwarfed the inconveniences suffered by white voters, if the Africans did have electoral power, there would probably have been an even greater political pressure to end apartheid. If the "median voter" did include Africans, Apartheid may have collapsed even sooner under sanctions; but again, there would be no Apartheid if Africans had the vote. MNCs decided to disengage from South Africa because continued engagement with South Africa would have entailed low future profitability, high conspicuity, and high Max Punishment. There was a weak positive economic incentive and a strong negative political and social disincentive to sanction-bust, leading to a decision to disengage. The disincentive from political and social sanctions exceeded incentives from the expected profit MNCs could gain by sustained engagement. As these incentives/disincentives are derived from several input factors, I will examine each of these inputs to determine how MNCs establish their incentives/disincentives. MNCs expected low future profitability from sanction-busting in South Africa due to expectations of low economic desirability of trading with South Africa, weak bargaining power in sanction-busting negotiation, and a long period of sanction. First, the South African economy was not a very desirable market for MNCs. For MNCs with FDI assets in South Africa, the revenue collected from operations in South Africa often amounted only to about two percent of total revenue, and thus was not essential for overall company future profitability.41 For international banks, historically South Africa's primary value had been a stable African investment option with higher interest rates than in the developed world. However, after MNCs with FDI assets retreated, destabilizing the economy in the process, the primary merit of South African investment – its stability – eroded, making South Africa a less desirable investment option. Second, the MNCs expected weak bargaining power from negotiation, so they were skeptical they could maintain competitive prices or profits because the MNCs would have to compete with competitive prices from budding but growing domestic manufacturers. In addition, numerous MNCs were engaged with pre-sanction South Africa; hence, in the "fog of war" where MNCs (like all market actors) are unaware of the decisions of their competitors, an MNC could not rule out the possibility that some of their competitors may also decide to sanction-bust, reducing their own bargaining power in undercutting South African prices. Finally, with the historical knowledge that the only other example of a comprehensive, U.N.-led sanction against another Apartheid African state, Rhodesia, was a protracted affair lasting 15 years despite early expectation that it would be over within the year, it would be expected that most MNCs probably anticipated the sanction against South Africa to be a long-term affair. Expectations for a longterm sanction reduced the need to maintain trade contact with South Africa in case commercial relations were normalized again soon. These input factors totaled to a weak, positive future profitability incentive to sanction-bust. MNCs perceived that any sanction-busting activity would be conspicuous and subject to a serious maximum potential punishment. This expectation was more a result of heightened public awareness than of government authority. Even before the sanctions were formally instated, several NGOs had dedicated themselves to exposing MNCs with engagements in South Africa. In the early 1960s, a decade before the mandatory U.N. sanctions were authorized, the Anti-Apartheid Movement (AAM) organized civilian boycotts of South African goods by naming and shaming companies engaged with South Africa.42The AAM fizzled out in the late 1960s, but other NGOs continued the fight. Several campus student organizations petitioned their universities to disinvest from MNCs engaged in trade with South Africa, often naming specific corporations that the universities were invested in.43 Because of this activism by an activated civil society, MNCs expected high visibility of sanction-busting operations in South Africa. This is not to say that the local black South Africans exercised little agency in combatting the Apartheid regime ruling over them. If anything, the civilian boycott in the West gained critical mass only after the world witnessed the intense resistance of black South Africans to the institution of the South African Constitution of 1983, which reaffirmed racial segregation.44 That said, external actors (inspired to action by the resistance of black South African internal actors) played the predominant role in shaping MNC behaviors. NGOs also had a deep well of support they could readily mobilize for boycotts and public campaigns, raising the maximum punishment that the public could inflict upon MNCs. In 1971, the U.S.-based Interfaith Center on Corporate Responsibility (ICCR) pressured corporations operating in South Africa to adopt the Sullivan principles – a seven-point program that demanded non-segregated workplaces and "equal and fair opportunities for all employees" regardless of race.45 Since it was illegal under South African law to abide by the Sullivan principles, the ICCR pressured companies to leave South Africa. Those that did not leave South Africa faced massive consumer and investor boycotts organized by the ICCR. Furthermore, the widespread student protests meant that 155 university institutions had disinvested from MNCs trading with South Africans by 1988. As such, NGOs saw that they would receive a severe punishment in the form of disinvestment by universities, who are key institutional investors, if they continued to sanctionbust.46 The NGOs also significantly raised the maximum punishment that the sanctioner government could impose.by pressuring municipal, local, and state governments to rescind lucrative government contracts with MNCs engaged with South Africa. Combined, these conditions created the threat of high maximum potential punishment by both the public and the government. Furthermore, because of the visibility of sanction-busting operations, the MNCs expected the full extent of the maximum punishment if they did engage with South Africa. As a result, a powerful negative disincentive, fueled by high conspicuity and high maximum punishment, overrode the weak positive incentive and led to the MNC decision to disengage. Rhodesia's ability to resist demands to abandon Apartheid was directly tied to the economic ramifications of the MNCs' continued engagement. The expansion of domestic manufacturing permitted by the oil import provided workers in sectors weakened by the sanction with alternative employment.54 Furthermore, the growing domestic manufacturing industry – and the economic health of the economy it helped maintain – also bolstered civilian morale. Secondly, Rhodesia could spend its foreign exchange on other vital economic concerns, as it did not need to pay a premium for smuggled oil. For example, without surplus cheap credit, Rhodesian agricultural subsidies for sanctioned tobacco goods would have quickly become unsustainable. The same foreign currency was also crucial to acquire weaponries needed to fight the guerilla war against Black nationalists.55 Finally, the abundance of oil meant the life of the median Rhodesian voter was largely unaffected. Rhodesians could still drive cars, as long as they carpooled every so often. If anything, what little oil rationing there was inspired a "rally-to-the-flag" effect on national unity that far outweighed the negative impact of the minor inconvenience.56 However, if oil shortages and the drop in white living standards were far more severe, Rhodesians could be expected to have behaved differently, perhaps demanding that the government cave to sanction demands. Although the MNC decision in the mediumto long-term was to sanction-bust in Rhodesia, this was not initially the case. At the very beginning of the sanction, incentives/disincentives motivated oil giant MNCs to disengage from the sanctioned economy. The oil giant MNCs initially cooperated with the British government, the primary sanctioner government, and agreed to stop oil shipments to Rhodesia. The MNCs chose not to sanction-bust as they expected only moderate future profitability in comparison to high conspicuity and high maximum punishment; the disincentives outweighed the incentives. However, overtime, these incentives/ disincentives changed, until they settled in a pattern of low future profitability, low conspicuity, and low Maximum Punishment. The new constellation of incentives/disincentives then encouraged MNCs to change their decisions from disengagement to engagement as although the low future profitability meant there was only a weak incentive, the low conspicuity and maximum punishment meant the negative disincentive to sanction-bust was even more marginal. Tracing MNC behaviors in Rhodesia in terms of the incentive/ disincentive model highlights that when incentives/disincentives change over time, MNC decisions will shift with the incentives. At the beginning of the sanction, the constellation of key input variables meant oil giant MNCs expected moderate future profitability from the sanction. Given how small the Rhodesian demand for oil was, the Rhodesian market had limited economic desirability. The MNCs also expected medium bargaining power. The Rhodesians had no domestic oil industries to compete with which the MNCs, giving MNCs monopolistic control over price controls. Furthermore, since there were only five oil giant MNCs operating in Rhodesia, the withdrawal of any one competitor would significantly lower competitive pressure. In light of the optimistic statements about the quick capitulation of the Apartheid regime by the government and the public, the MNCs did not expect sanctions to last long. In total, the input variables of low general economic desirability, medium bargaining power, and short expected duration of sanction, resulted in the MNC expectation of moderate future profitability from sanction-busting. However, as the sanction progressed, the future profitability incentive begun to change. The sanction, which everyone claimed would be over very quickly, dragged on for years. Hence, the MNCs now expected a sanction with a longer duration. With lower expectation that trade relations would be normalized anytime soon, the MNCs felt less compelled to maintain trade contact. This change in this input meant its output, the future profitability incentive, changed: now, there was a weak future profitability incentive to continue trade. At the beginning of the sanction, the MNCs expected high conspicuity from engaging in sanction-busting because they expected visibility from the sanctioner government of United Kingdom. The British government declared that the British navy would enforce the sanction by identifying any ships carrying oil to ports that were conventionally used to transport oil to Rhodesia.57 Once the ships were identified, they could easily be tracked to their patron oil giant MNC; hence, the high conspicuity of MNC sanction busting. When Joanne V, an oil tanker, defied the British blockade and sailed into Beira, a Mozambique port used to transport oil to Rhodesia, the British government – sanctioned by a U.N. resolution to use force if necessary to stop the oil trade – declared that any ships that unloaded oil destined to Rhodesia would be seized.58 The threat was taken seriously by MNCs: Joanne V left the Mozambique port without unloading its oil.59 Attempts by MNCs to break the blockade by using an oil pipeline of significant symbolic value as the connection between Rhodesia and South Africa were also shut down by the British government. Most MNCs saw the highly conspicuous, punishable nature of trading with Rhodesia to be a disincentive that far outweighed the paltry future profitability incentive and disengaged from Rhodesia. However, as time went on, the MNCs increasingly perceived low conspicuity since South African state practices changed the incentive structure. MNCs could deliver oil anonymously to Rhodesia as South Africa offered to purchase oil from MNCs and then sell it to Rhodesia. This permitted MNCs to claim plausible deniability – how could MNCs "know," and so take responsibility for, what the South Africans were going to do with the oil once it was sold? In addition, the public attention to the sanction-busting operations was diverted from the sanction-busting MNCs to the South African regime that permitted it; thus, the increased South African notoriety caused reduced MNC conspicuity. As for maximum punishment, South African state practice again changed the incentive structure. By threatening to impose a mutually painful countersanction onto the British economy, the South African regime prohibited the British from blockading a few Mozambique ports that were used to supply oil to both Rhodesia and South Africa. The official reason given for this prohibition by the South African government was that a blockade of the Mozambique ports would threaten South African access to oil. As a result, cargo ships transporting oil to these ports, whether with South African or Rhodesian contracts, were immune to British reprisals. Under the pretext of "protecting national interest in protecting South African access to oil," the South Africans protected the Rhodesian oil trade. The MNCs saw that the British were spooked by the South African protests and, unwilling to risk a potential South African countersanction, would not enforce a comprehensive blockade of all ports.60 Because of South African state practice, the incentive structure changed, and given low future profitability, low conspicuity, and marginal maximum punishment, MNCs changed their commercial orientations and sanction-busted on behalf of Rhodesia for the rest of the sanction duration. "Low" implies negligible amounts that only marginally tips the balance of the equation. "Moderate" implies a considerable amount that can affect MNC decision-making unless it is overdetermined by a "high" value, which has the potential of single handedly determining the outcome. The behaviors of MNC operating under sanctioned regimes offer insights into what make sanctions effective. Truly effective sanctions must consider the corporate calculus of MNCs, and shape the incentive/ disincentives driving corporate behavior to one of compliance with the law. The most important implication of the incentive/disincentive model is that makers of sanction policy should not only focus on threatening the MNCs, but also increasing their conspicuity in sanction-busting operations. Policymakers should prioritize raising the conspicuity of sanction-busting activities just as much as designing punishments for misbehavior; after all, the most severe punishments are paper tigers unless they are enforceable, and punishments are enforceable if and only if they can be detected in the first place. Furthermore, policymakers must be aware that, as observed in Rhodesia, third-party states can easily manipulate the MNC incentive structure to promote sanction-busting. South African intervention in the sanction structure for Rhodesia ultimately shaped MNC behavior in a way that limits sanction effectiveness. Policymakers must plan for another "South Africa" contingency by preparing to counter such attempts by third party states to undermine sanction effectiveness. There are a few caveats to this model. First, the increased public awareness of MNC sanction-busting was assumed to encourage the public to enforce punishments. This may not necessarily the case if the public is indifferent to, or perhaps even hostile to, the government's sanction policy. If the public does not perceive the MNC sanction-busting as deplorable, they will not be motivated to punish the MNC for it. Second, the conspicuity of MNC behavior from the standpoints of the government and the public was assumed to be the same. This was not too much of an issue in these two cases, where the sanctioner regimes were liberal democracies where information was, in fact, shared between the public and government. This may not always be the case, especially if the sanctioner regime is not liberal democratic. In the case of the OPEC oil embargo, for example, autocratic sanctioner regimes may not readily share what they know with their citizens. There is yet to be a method of determining – beyond qualitative terms – the amount of clout MNCs have in a sanctioned economy. In South Africa, the sheer number of MNCs implied heavy MNC clout, but clout does not necessarily require numbers. In Rhodesia, while fewer MNCs were operating, the MNC oil monopoly in the Rhodesian market made them punch far above their weight in terms of importance to the national economy. The more MNCs control crucial resources, the more impact they have on the national economy. In this model, a linear relationship was assumed between conspicuity and the actual punishment sustained by the corporations. This may not necessarily be the case. The government and the public may tolerate MNC misdemeanors to a point and only retaliate if the MNCs overstep a critical line. Future research should clarify whether the relationship between conspicuity and actual punishment is actually linear or, if fact, incremental, where actual punishment remains unchanged for increasing conspicuity until a point, at which the actual punishment shoots up. Lastly, this model assumed that a negative profit from sanction-busting behavior would encourage MNCs to disengage from the sanctioned economy. This is not always so. If a MNC loses even more money by disengaging from a sanctioned economy, it may prefer remaining engaged with a sanctioned economy, even if it operates at a net loss. Despite its limitations, the incentive/disincentive model has large implications for the sanction literature. I hope this paper is the much needed intervention in sanction literature to distance it away from state-centric solutions. Perhaps further research can investigate the impact of other nonstate actors on sanction effectiveness. In particular, the impact of NGOs on sanction effectiveness seems to be a natural next step. I tangentially referred to the indirect role of NGOs in determining sanction effectiveness by exploring how NGO activities affected the incentive structures of MNCs, but NGOs deserve a much more thought-out investigation on how they affect sanction effectiveness in their own right. The incentive/disincentive model also can hopefully assist analysts in evaluating the non-state mechanisms that determine the effectiveness of sanctions in place today. The case of North Korea seems ripe for investigation. Despite the several rounds of severe sanctions imposed on the hermit kingdom to persuade it to abandon its nuclear program, the North Koreans continue to survive, buoyed by sanction-busting Russian and Chinese firms61. Realistically, there is little the international community can do through economic coercion to convince the powerful, autarkic Chinese and Russian states to refrain from supporting sanction-busting firms. Perhaps, however, the Chinese and Russian firms themselves can be convinced of the errors of their ways by manipulating their incentive structures. Thankfully, the policymakers seem to have realized this earlier than academics. The U.S. treasury has imposed rounds of secondary sanctions not on states trading with the North Koreans, but on individual sanction-busting firms.62 These firms are now barred from interacting with U.S.-based firms, putting them at major competitive disadvantage. These secondary sanctions were installed only recently at the time this article was written, so it is too early to evaluate how effective they are, and anyhow they are beyond the scope of this paper. While it is encouraging that policymakers are turning towards non-state centric solutions, further research should apply the incentive/disincentive model to explain whether Russian and Chinese firms were actually dissuaded from sanction-busting. Andreas, Peter. "Criminalizing Consequences of Sanctions: Embargo Busting and Its Legacy." International Studies Quarterly 49, no. 2 (2005): 335-60. doi:10.1111/j.0020-8833.2005.00347.x. Baldwin, David A. Economic statecraft. Princeton, NJ: Princeton University Press, 1985. Baldwin, David A. "The Sanctions Debate and the Logic of Choice." International Security 24, no. 3 (2000): 80-107. doi:10.1162/016228899560248. Barbieri, K., O. M.g. Keshk, and B. M. Pollins. "Trading Data: Evaluating our Assumptions and Coding Rules." Conflict Management and Peace Science 26, no. 5 (2009): 471-91. doi:10.1177/0738894209343887. Biglaiser, Glen, and David Lektzian. "The Effect of Sanctions on U.S. Foreign Direct Investment." International Organization 65, no. 03 (2011): 531-51. doi:10.1017/s0020818311000117. Brooks, Risa A. "Sanctions and Regime Type: What Works, and When?" Security Studies 11, no. 4 (2002): 1-50. doi:10.1080/714005349. Christopher, A. J. "The pattern of Diplomatic Sanctions against South Africa 1948-1994." GeoJournal 34, no. 4 (December 1994): 439-46. Cohen, Andrew. "Lonrho and Oil Sanctions against Rhodesia in the 1960s." Journal of Southern African Studies 37, no. 4 (2011): 715-30. doi:10 .1080/03057070.2011.611286. Higginson. Collective Violence and the Agrarian Origins of South African Apartheid, 1900-1948. Cambridge University Press, 2014. Davis, Lance, and Stanley Engerman. "History Lessons Sanctions: Neither War nor Peace." Journal of Economic Perspectives 17, no. 2 (2003): 187-97. doi:10.1257/089533003765888502. Drezner, Daniel W. "How Smart are Smart Sanctions?" International Studies Review 5, no. 1 (2003): 107-10. doi:10.1111/1521-9488.501014. ———. "Sanctions Sometimes Smart: Targeted Sanctions in Theory and Practice." International Studies Review 13, no. 1 (2011): 96-108. doi:10.1111/j.1468-2486.2010.01001.x. Drury, A. Cooper. "Reviewed Work: Manipulating the Market: Understanding Economic Sanctions, Institutional Change and the Political Unity of White Rhodesia by David M. Rowe." The American Political Science Review 96, no. 4 (December 2002): 892-93. Early, Bryan R. Busted sanctions: explaining why economic sanctions fail. Stanford, CA: Stanford University Press, 2015. Galtung, Johan. "On the Effects of International Economic Sanctions, With Examples from the Case of Rhodesia." World Politics 19, no. 03 (1967): 378-416. doi:10.2307/2009785. Hufbauer, Gary Clyde., Jeffrey J. Schott, and Kimberly Ann Elliott. Economic sanctions reconsidered. Washington, DC: Institute for International Economics, 1990. Kastner, S. L. "When Do Conflicting Political Relations Affect International Trade?" Journal of Conflict Resolution 51, no. 4 (2007): 664-88 doi:10.1177/0022002707302804. Kirshner, Jonathan. "The microfoundations of economic sanctions." Security Studies 6, no. 3 (1997): 32-64. doi:10.1080/09636419708429314. ———. "Economic Sanctions: The State of the Art." Security Studies 11, no. 4 (2002): 160-79. Knight, Richard. "Sanctions, Disinvestment, and U.S. corporations in South Africa." In Sanctioning Apartheid. Africa World Press, 1990. Lektzian, D., and G. Biglaiser. "The effect of foreign direct investment on the use and success of US sanctions." Conflict Management and Peace Science 31, no. 1 (2013): 70-93. doi:10.1177/0738894213501976. Levy, Philip I. "Sanctions on South Africa: What Did They Do?" American Economic Review 89, no. 2 (1999): 415-20. doi:10.1257/aer.89.2.415. Martin, Lisa L. "Credibility, Costs, and Institutions: Cooperation on Economic Sanctions." World Politics 45, no. 03 (1993): 406-32. doi:10.2307/2950724. Minter, William, and Elizabeth Schmidt. "When Sanctions Worked: The Case of Rhodesia Reexamined." African Affairs 87, no. 347 (April 1988): 207-37. Moreno, Elida. "Panama detains Mossack Fonseca founders on corruption charges." Reuters. February 11, 2017. Accessed November 15, 2017. https://www.reuters.com/article/us-panama-corruption-odebrecht/panama-detains-mossack-fonseca-founders-on-corruption-charges-idUSKBN15Q0TK. Naylor, R. T. Economic warfare: sanctions, embargo busting, and their human cost. Boston: Northeastern University Press, 2001. Naylor, R. T. Patriots and profiteers: economic warfare, embargo busting, and state-sponsored crime. Montreal: McGill-Queen's University Press, 2008. Otusanya, Olatunde Julius. "The role of multinational companies in tax evasion and tax avoidance: The case of Nigeria." Critical Perspectives on Accounting 22, no. 3 (2011): 316-32. doi:10.1016/j.cpa.2010.10.005. Pape, Robert A. "Why Economic Sanctions Do Not Work." International Security 22, no. 2 (1997): 90. doi:10.2307/2539368. PAZZANI, MICHAEL J. CREATING A MEMORY OF CAUSAL RELATIONSHIPS: an integration of empirical and explanation-based... learning methods. S.l. : PSYCHOLOGY PRESS, 2016. Quirós, Jorge E. "La entrevista sobre "Panama Papers" que puso contra las cuerdas al presidente Varela." TVN. October 22, 2016. Accessed November 15, 2017. https://www.tvn-2.com/nacionales/Varela-reaciona-cuestionado-Papeles-Panama-entrevista-Jenny-Perez-Alemania_0_4603789596.html. Rodman, Kenneth A. "Public and Private Sanctions against South Africa." Political Science Quarterly 109, no. 2 (1994): 313. doi:10.2307/2152627. Rodman, Kenneth A. "Sanctions at bay? Hegemonic decline, multinational corporations, and U.S. economic sanctions since the pipeline case." International Organization 49, no. 01 (1995): 105. doi:10.1017/ s0020818300001594. Rodman, Kenneth Aaron. Sanctions beyond borders: multinational corporations and U.S. economic statecraft. Lanham, MD: Rowman & Littlefield Publishers, 2001. Rowe, David M. "Economic sanctions do work: Economic statecraft and the oil embargo of Rhodesia." Security Studies 9, no. 1-2 (1999): 25487. doi:10.1080/09636419908429401. Rowe, David M. Manipulating the market: understanding economic sanctions, institutional change, and the political unity of white Rhodesia. Ann Arbor: University of Michigan Press, 2001. Samasuwo, Nhamo W. "An assessment of the impact of economic sanctions on Rhodesia's cattle industry." Historia 47, no. 2 (November 2002): 655-78. Schmidt, Elizabeth. "Review: Rhodesian Sanctions: The Long View." Journal of Southern African Studies 29, no. 1 (March 2003): 311-12. Stephenson, Glenn V. "The Impact of International Economic Sanctions on the Internal Viability of Rhodesia." Geographical Review 65, no. 3 (1975): 377. doi:10.2307/213536. Sullivan, Leon. "The Sullivan Principles." Sullivan Principles. Accessed November 15, 2017. http://www.marshall.edu/revleonsullivan/principles.htm. "The Anti-Apartheid Movement, Britain and South Africa: Anti-Apartheid Protest vs Real Politik." African National Congress. Accessed November 15, 2017. http://www.anc.org.za/content/anti-apartheid-movementbritainand-south-africa-anti-apartheid-protest-vs-real-politik. "US hits Chinese and Russian firms over North Korea." BBC News. August 23, 2017. Accessed November 15, 2017. http://www.bbc.co.uk/news/world-us-canada-41018573. Weida, Jason Collins. "Reaching Multinational Corporations: A new model for drafting effective economic sanctions." Vermont Law Review. White, Luise. Unpopular sovereignty: Rhodesian independence and African decolonization. Chicago: The University of Chicago Press, 2015. Yuichiro Kakutani is a junior from Cornell University majoring in government and history. His interest areas include political theory, comparative political economics, and Japanese politics. Lance Davis and Stanley Engerman, History Lessons. Sanctions: Neither War nor Peace (Journal of Economic Perspectives, vol. 17, no. 2, 2003), 187. "Sanctions," U.N. Security Council Subsidiary Organs, accessed October 6th 2016,. Gary Clyde Hufbauer, Jeffrey J. Schott and Kimberly Elliot, Economic Sanctions Reconsidered, (Peterson Institute for International Economics, 2007,) 89. Hurbauer, Economic Sanctions Reconsidered, 91. Michael J. Pazzani, Creating a Memory of Causal Relationships: An Integration of Empirical and Explanation-Based Learning Method, (NYC: Psychology Press, 1990,) 256. Gatlung, Effects of International Sanctions, 385. "South Africa economic stats and indicators," Economy Watch. Elizabeth Schmidt, Review: Rhodesian Sanctions: The Long View, (Journal of Southern African Studies, vol. 28, no.1, 2003), 311. Stephenson, The Impact of Economic Sanctions, 388. Galtung, Effect of International Economic Sanctions, 390. Kenneth A. Rodman, Public and Private Sanctions against South Africa, (Political Science Quarterly, vol. 109, no.2, Summer 1994), 330. David M. Rowe, who declared in the title of his 2007 article that "sanctions do work," played a significant role in this shift in academic consensus. His landmark book Manipulating the Market: Understanding Economic Sanctions, Institutional Change, and the Political Unity of White Rhodesia argued that sanctions did in fact play a significant role in the end of the Rhodesian regime. Elizabeth Schmidt, Jonathan Kirshner, and Dury reviewed the book and accepted Rowe's argument that sanctions did "work" in defeating the Rhodesian regime. In Schmidt's words: "[Rowe] argues, quite convincingly, that the early scholarship was wrong." Nhamo W. Samasuwo, An assessment of the impact of economic sanctions on Rhodesia's cattle industry, 1965-72, (Historia, vol. 47, no.2, 2002,) 657. Gatlung, Effects of International Economic Sanctions, 378. Daniel W. Drezner, Sanctions Sometime Smart: Targeted Sanctions in Theory and Practice, (International Studies Review, vol. 13, 2011), 96-108. Olatunde Julius Otusanya, The Role of Multinational Companies in Tax Evasion and Tax Avoidance: The Case of Nigeria, (Critical Perspectives on Accounting, vol. 22, no.3, 2011), 31632. Consider the public response to the leakage of the panama papers, which not only exposed tax evasion but also sanction-busting operations. The Panaman president Juan Carlos Varela had acknowledged he was "friends" with a managing partner of the firm responsible for the sanction busting operation prior to the leak in an interview; while we will never know for sure, it seems unlikely he was completely unaware of the significant sanction-busting activities occurring in his country. After the panama papers were outed, the state was forced to move toward the arrest of the individuals involved in the money laundering scheme amid allegations damaging to the state's authority that incriminated Panama as a "tax haven." Kenneth A. Rodman, Public and Private Sanctions against South Africa, (Political Science Quarterly, vol. 109, 2, 1994), 313-314. Philip I. Levy, Sanctions on South Africa: What did they do?, (The American Economic Review, vol. 89, 2, 1999) 417. Alan Hirsch, The Origin and Implication of South Africa's continuing financial crisis, (Transformation, issue 9, 1989), 31. Rodman, Public and Private Sanctions, 318. Colin McCarthy, Productivity Performance in Developing Countries, 317. Rodman, Public and Private Sanctions, 314. Arianna Lisson, The Anti‒Apartheid Movement, Britain, and South Africa Anti–Apartheid movement versus real politik, (2002) PhD Dissertation, retrieved from African National Congress,. U.S. Senate Committee on Banking, Housing, and Urban Affairs. The Anti-Apartheid Act of 1985. (U.S. Government Printing Office, 1985), p. 213. Leon Sullivan, The Sullivan Principles, retrieved from Marshall University. Richard Knight, Sanctions, Disinvestment, and U.S. corporations in South Africa. David M. Rowe, Economic Sanctions do work: Economic statecraft and the oil embargo of Rhodesia, (Security Studies, vol 9, issue 1, 2007), 254-287. Stephenson, Impact of Economic Sanctions, 383. Rowe, Sanctions do work, 266. Economic Survey of Rhodesia for 1973, (Government Printer, 1974), 19-20. David M. Rowe, Manipulating the Market, (University of Michigan Press, 2001),96-133. R.T. Naylor, Patriots and Profiteers: Economic Warfare, sanction-busting, and state-sponsored crime, (Mcgill-Queen's University Press, 2008), 137. Naylor, Patriots and Profiteers, 137. Galtung, International Economic sanctions, 390. Rowe, Economic Sanctions do work, 266. Chicago Tribune, Rhodesia will not use oil on Joanne V, (April 16, 1967). Rowe, Manipulating the Markets, 150.